Begin the flow of youthfulness with destressing the body & mind to create inner and outer beauty. The Eternale™ System is based on decades of research conducted in the field of bio-energetic technology. Eternale™ stimulates appearance using a high-speed digital sensing interface and sophisticated waveform generator at safe yet profound the levels. Inner beauty creates outer beauty & living a beautiful life allows us to experience joy. You naturally possess an astounding amount of energy to renew life and you are Eternal. The Eternale™ includes audio relaxation exercises to help shape your mental beliefs about a positive self esteem, so that you can radiate your beauty from within. We have carefully orchestrated musical notes known as the lost Solfeggio Tones to support the relaxation process through the vibrational patterns of these notes. 1) Carefully orchestrated musical compositions with the lost Solfeggio tones deeply support meditation and relaxation. 2) Guided visualizations and audio relaxation exercises help elicit positive self esteem, body image, stress relief, weight management and much more. 3) Gentle almost imperceptible vibrations facilitate the enhancement of appearance. This process relieves muscle tension, soothes the mental state and softens facial lines. The result is a more harmonious realization of body and mind. 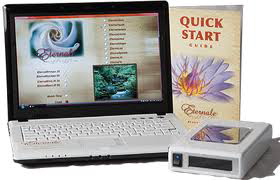 The Eternale Rejuvenation System’s unique ability to relax a user during a session has been proven to alleviate the negative effects that are brought on by daily stressors. With just one session, the user is able to unwind, while the body and mind are restored to a place of peace, tranquility and restfulness. The Eternale Rejuvenation System allows your body to take a break from the imbalance caused by environmental stressors, pollutants and day-to-day habits that can overburden your system. Eternale supports the body in releasing these stressors, allowing for optimal rejuvenation on all levels. The Eternale Rejuvenation System’s micro-current technology uses gentle electrical stimulation to trigger the body’s natural impulses; energizing muscles and facial tissue. Gentle electrical impulses also allow your body to recharge so that you can reach and sustain your maximum potentials. 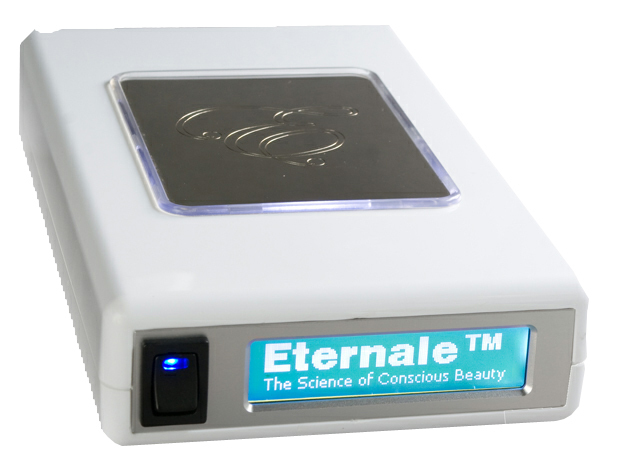 Recent Eternale clinical trials in Australia utilized an Enhanced Image Technologies Camera to measure the Eternale's rejuvenating effects on skin and facial tissue. “Electricity can enhance or boost any function in the body. It has the ability to reach everywhere through the fasciae, which rapidly conduct current. Cutting-edge research shows that light and electricity travel almost instantaneously throughout the body.” “Frequently taking low levels of electrical current on a regular basis is highly effective in healing injuries”. Like all forms of electrical therapy, Eternale’s micro-currents increase circulation, thereby increasing oxygen flow; and stimulating the production of collagen. One of micro-current’s biggest benefits, however, is the boosting of adenosine triphosphate (ATP), an energy carrier molecule that transfers energy from chemical bonds to endergonic (energy absorbing) reactions within the cell for building proteins, contracting muscles and other biological functions (Source: University of Bristol Department of Chemistry). Trigger production of important amino acids and ATP! The Eternale Rejuvenation System allows you to take a break from the pressures of everyday stress and aging. Have you ever wanted to escape the drains of work, relationships or other stressful events that cause you to hold tension on a regular basis? In addition to releasing the pressures and detrimental side effects of stress, the Eternale Rejuvenation System can also revitalize your skin, restoring its youthful appearance. Micro-current vibrations allow for the reduction of fine lines, dark circles and increase the elasticity of your skin; resulting in a tighter, smoother look and feel of the face and body. Being a sophisticated multi-functional device, the Eternale Rejuvenation System can also help you shed unwanted pounds. Forget, expensive gym memberships, killing yourself on the treadmill or depriving yourself of your favorite foods. With the Eternale, your body will be encouraged to welcome better foods, increase your metabolism and allow you to slip back into your favorite jeans! The Eterna-Shape Program utilizes the active mechanisms of micro-current which have been proven to also increase circulation of blood and lymphatic systems resulting in an increased metabolism and a reduction in cellulite. When combined with our guided imagery and scripts to support healthy weight management it is a powerful tool for helping clients curb less desirable cravings, shed unwanted pounds, and positively change their relationship to food with greater ease. The Eternale “recharges and rejuvenates” tissue. The combination of different frequency variations allows the Eternale Rejuvenation System to show results in tissue enhancement and cellular repair. The frequency variations in the current can be concentrated on specific tissues, thus are adapted to the individual needs of each client. The use of accessories like our face veil, eye masks, silver lined blanket, rollers, probes, hand gloves and booties allow for even further tailoring and amplification of the therapeutic effects. The results are often profound and surprising. Micro-current treatment involves the use of safe, painless, low-level, waveform-shaped currents (electrical impulses) which work to “reprogram” the muscles to nearly original muscle shape. The gentle electrical impulses actually rehabilitate the muscles and improve circulation, texture, tone, and fine lines. Electricity and science are two of the most sensible elements that can be used during esthetic treatments because of the body’s nature as a complete electrical system. Micro-current facial machines can be used to improve the muscle reception and re-educate the muscle to respond more effectively to regular nerve stimulation. 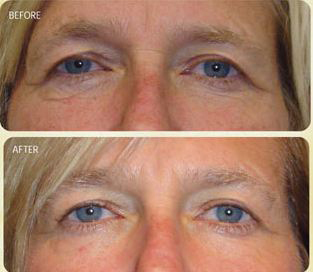 A semi-contracted facial muscle is the most visually appealing, and functionally effective. The Eternale can help restore this muscle “memory”, giving better tone to the face and relaxing over worked or contracted muscles, resulting in firmer facial tone and diminished lines. Stress affects us all. The detrimental effects of excess stress have been well documented in a wide range of medical publications. Thousands of research articles, studies and books prove beyond a shadow of doubt, that stress can be a factor in any disease. Stress alters biochemistry, neurological functioning and can weaken the immune system and the digestive tract. This neuro-psychological-immuno link is well established in many peer reviewed medical journals on Psychoneuroimmunology. Increased Heart Rate - which can lead and/or contribute to heart conditions. Hormonal Fluctuations - which can lead and/or contribute to endocrine, reproductive, digestive disorders, obesity, diabetes and mental disorders. Constriction of muscles and blood vessels - which can lead and/or contribute to pain, tension, circulatory issues, cardio-pulmonary issues and asthma. The suppression of non-essential life processes - which affects reproduction, higher executive brain function, digestion and immunity. The deep relaxation process facilitated by all three aspects of our unique Eternale experience can be one of the best ways to combat stress and restore physiological harmony. The Eternale Rejuvenation System has a music only option. Select the music only option if you just want to relax with the beautiful soothing sounds of the Solfeggio Tones. One of the many benefits of the Eternale is the automated program that can serve a client, friend or family member while the practitioner is able to attend to other business. Press play and walk away is just some of the luxury offered by the Eternale. One of the many benefits of the Eternale is the automated program that can serve a client, friend or family member while the practitioner is able to attend to other business. Press play and walk away is just some of the luxury offered by the Eternale. A restorative combination of programs, designed to promote optimal relaxation and rejuvenation. EternaVitale - will replenish your optimal energy levels and work to rebalance the seven major energy centers of the body, allowing you to function with optimal ease, joy and efficiency. EternaYouth - brings you all the powerful healthy aging benefits of micro current tech- nologies helping you look and feel years younger. EternaSerene - this is the ultimate deep relaxa- tion program for easing away tension, stress and pain; also excellent for improving sleep habits, and enhancing meditation. EternaEnviro - offers the mind and body an oasis of relief from daily environmental stress, toxins, EMF, noise, pollution and more. EternaGlow - designed to help allow your inner beauty to truly shine forth, enhancing the healthy radiance and glow of the skin, restor- ing clarity and sparkle in the eyes. EternaShape - maintaining a body weight that is comfortable, attractive and healthy can be an easy process of self- nurturing; facilitates positive changes in attitudes toward food and other cravings. EternaLux - lustrous, shiny hair is a telltale indica- for of health. Our EternaLux program is one of our mane attractions, known to diminish the appear- acne of unwanted greys. EternaSphere - micro current technologies are known for stimulating and improving circulation which can have many health benefits. EternaS- phere focuses on the eliminating of cellulite, and improving self image and confidence. This all natural “face-lift” enhances facial appearance and combats the effects of gravity. The EternaLift program creates a dramatic improvement in facial lines and wrinkles, as well as a gradual tightening of the loose skin around the face, neck and chin area. All natural “face-lift” enhance facial appearance and combat gravity. Our signature select service combines our . EternaMini Spa treatment (EternaVitale, EternaYouth, EternaSerene and EternaEnviro), with our delightful and impactful energetic face lift for the most well rounded improvement of body, mind, spirit and appearance. Energetic Face Lift plus EternaVitale, EternaYouth, Eterna Serene and Eterna Enviro. Each of our three to five minute individual programs utilize targeted micro-current vibrations to help clients meet a variety of goals related to physical appearance and enhanced performance. The corresponding musical scores and guided imagery are designed to bring the listeners conscious awareness and intention to the focused area to produce positive changes in mental perceptions, attitudes and daily habits. EternaFit - Offers all of the support, inspiration and motivation of your own personal trainer. Experience your very best at work, in the gym, or in athletic performance. An excellent add-on to any of our services!